LSD, commonly referred to as “acid,” is sold on the street in tablets, capsules, and, occasionally, liquid form. It is odorless, colorless, and has a slightly bitter taste and is usually taken by mouth. 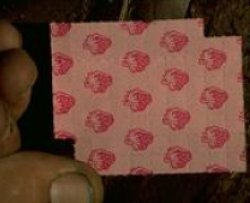 Often LSD is added to absorbent paper, such as blotter paper, and divided into small decorated squares, with each square representing one dose. The effects of LSD are unpredictable. They depend on the amount taken; the user’s personality, mood, and expectations; and the surroundings in which the drug is used. Usually, the user feels the first effects of the drug 30 to 90 minutes after taking it. The physical effects include dilated pupils, higher body temperature, increased heart rate and blood pressure, sweating, loss of appetite, sleeplessness, dry mouth, and tremors. Users refer to their experience with LSD as a “trip” and to acute adverse reactions as a “bad trip.” These experiences are long – typically they begin to clear after about 12 hours. Most users of LSD voluntarily decrease or stop its use over time. LSD is not considered an addictive drug since it does not produce compulsive drug-seeking behavior as do heroin, amphetamine, cocaine, alcohol, and nicotine. However, like many of the addictive drugs, LSD produces tolerance, so some users who take the drug repeatedly must take progressively higher doses to achieve the state of intoxication that they had previously achieved. This is an extremely dangerous practice, given the unpredictability of the drug. NIDA is funding studies that focus on the neurochemical and behavioral properties of LSD. This research will provide a greater understanding of the mechanisms of action of the drug.